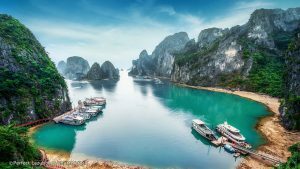 Halong Bay is located on the northern coast in the Gulf of Tonkin, about 180km (106 miles) from Hanoi, with a travel time of between three to four hours along a fairly straight and level piece of road (though it can be bumpy!). You can also find 30-minute flights between Hanoi and Halong Bay that reduce exhausting travel time, leaving you with more energy and available hours to explore the bay and its sights. The Bay is dotted with 1,600 limestone islands and islets and covers an area of over 1,500 sqkm. This extraordinary area was declared a UNESCO World Heritage Site in 1994. For many tourists, this place is like something right out of a movie. 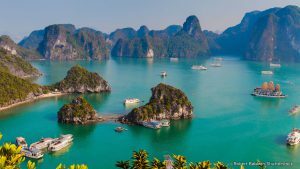 The fact is that Halong Bay features a wide range of biodiversity, while the surrealistic scenery has indeed featured in endless movies. 5:00: We pick you up at Dong A II Hotel. Departure for Ha Long city. Halfway there, we’ll stop for short break. 11:00: We arrive in Ha Long, have lunch and check in your room in Grand Ha Long Hotel. 18.30: Have dinner and stay overnight at Ha Long City. After dinner, you will have time to visit night market. 7.00: Breakfast serving time at your hotel. 11:00: You check out the room, have lunch in the restaurant then get ready for bus pick up at 12.30. 13:00: Departure for Thai Nguyen. 16:00: We arrive in Thai Nguyen and drop you off at Dong A II. Ba Be means Three Lakes, as the name there are three big parts includes: Pe Leng, Pe Lam, and Pe Ly. It is the largest freshwater lake in Vietnam with the square over 500ha, sitting at 150m above sea level. Ba Be Lake lies in the middle of the vast limestone mountain range of Ba Be National Park with large and small islands of limestone rising out of the water, many of which can be explored as you kayak around. Having been formed approximately 200 million years ago, the lake is surrounded by limestone cliffs, which in turn are covered by primary forests.There are also several caves to find, with beautiful rock formations that have developed over millions of years. Of those, a good example is Puong Cave, through which the Nang river runs under its magnificent limestone structures. It is 30 meters wide, and 300 meters deep with thousands of stalactite and stalagmite structures and a bat colony numbering tens of thousands. Its picturesque entrance lies to the north east of Ba Be Lake, in the hillside of the Lung Nham Range.